Although there are a variety of medical treatments that can effectively treat most cases of hair loss, many individuals choose to go the natural route instead. And while lots of these natural remedies can offer effective treatment, their proper use and expected results must first be properly understood. By using natural remedies, hair loss sufferers can avoid the pain, inconvenience, and relatively high cost of medical and commercial treatments. Plus, many individuals who follow a natural lifestyle prefer the organic base of natural remedies. Best of all, natural remedies are readily available, easy to mix and use, and lack the unwanted side effects often associated with other forms of hair loss treatment. The most common base of natural hair loss remedies is herbs and essential oils. Over time scientists and the general population have come to accept the effectiveness of many natural substances in the healing and curing of illness and disease. When used alone or mixed to form a poultice these herbs can help stimulate hair growth. Red pepper – this herb can be mixed with water and applied to the affected areas of the scalp. The pepper irritates the skin and causes the release of histamines in the area. These histamines can alter cell division and encourage hair follicle production. 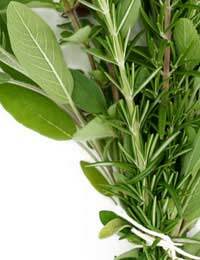 Rosemary and sage – these two herbs can be boiled together to make a rinse that promotes hair growth. After steeping strain the water form the herbs and use it as a rinse after shampooing. This will help stimulate hair follicle production and end extended resting phases in the Hair Growth Cycle. Aloe Vera – this plant has been proven to balance the pH level of the scalp, clean the hair follicles, and heal irritated skin. Applying the gel or liquid of this plant directly to the scalp can help activate two of the enzymes in the body that are responsible for normal hair growth. Safflower, lavender, thyme, bay, and cedar essential oils – these oils can stimulate the hair follicles into production, dilate blood vessels to boost blood flow, and relax the skin to prepare it for healing. Applying these oils, either alone or mixed with jojoba or grapeseed oil, can help promote hair growth in areas of temporary hair loss. No matter which herb or essential oil you choose for hair loss treatment you can boost the effectiveness of the treatment by accompanying the application with Massage. By massaging the skin of the scalp for at least 15 minutes before or during the application you can increase the stimulation of the hair follicles, increase the blood flow to the area, and help the oil or herb penetrate more deeply. Aside from the application of herbs and oils there are a few others ways that individuals can explore natural remedies for hair loss. Some individuals experience great results from rubbing the cut side of a raw onion on the affected areas of the scalp. The high sulphur content of this vegetable may help heal the skin and stimulate hair follicle production. Another popular natural remedy for hair loss involves adding henna to your regular conditioner. The ingredients in henna can help heal the hair follicle and increase hair growth. It can also seal the cuticle of the hair thus making it stronger and more resistant to breakage. Lastly, many individuals swear by the effectiveness of hypnosis for the treatment of hair loss. These individuals believe that hypnosis can lower anxiety and reduce stress – both of which have been shown to encourage hair loss. They also believe that hypnosis can be used to guide the brain into stimulating hair growth and extending the growing phase of the hair growth cycle. No matter which natural remedy for hair loss you choose you should be careful to read the instructions on all labelling prior to use and use the treatment only as directed. With a little patience and effort you will soon be enjoying the reward of new hair growth. Good grooming can help you to maintain your hair. Find out more in our feature Can Poor Hair Care Cause Hair Loss?.